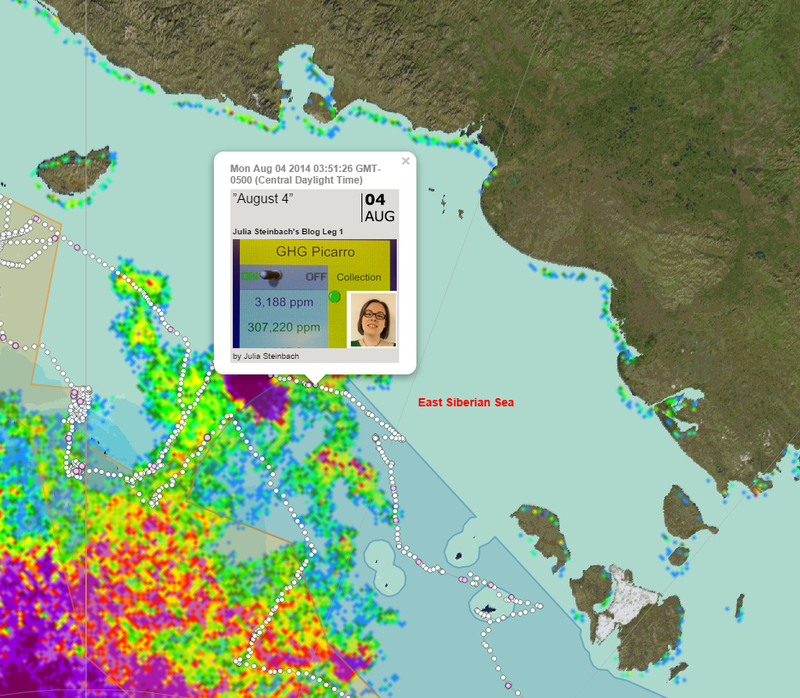 The SWERUS C-3 first leg found a second major methane seep on August 3, 2014 in the East Siberian Sea. Julia Steinbach, a member of the expedition, blogged this find on August 4th, 2014. SWERUS C-3 August 4, 2014 blog spot. "At one station, we really manage to catch signals from a flare with all sampling devices more or less at the same time. In general, we managed to characterize a small source region with high methane levels and quite some bubble flares – and in the 5 days prior to arriving at the source region, we have been seeing continuously rising methane levels in the surface and midwater – not so much in the bottom, so this seemed to be the signal transported from the source region." What we learn from this is that a methane release area can increase methane saturation in the water over a considerable area, while most might break down in the ocean, as saturation gets higher, or as more gets trapped under sea ice, it is possible that more atmospheric release might occur. WEGAS - Continuous methane measurement in sea water. "The other “methane” hero I want to mention today is Marc. You have read in earlier posts – both by me and also by some others – about the continuous methane measurements from the seawater intake, and Marc is the one running (and having developed) this system that is very useful to guide us to good spot for sampling and to enhance the spatial resolution of our measurement in between stations..."
"For most people on the ship, Marc’s system (the "WEGAS", standing for "Water Equilibration Gas Analyzer System") looks like that: That is the view of the “methane webcam“ on the bridge showing the results of the online measurement – basically just a normal camera pointing at his screen, filming the part of it that shows the actual methane concentration in the seawater." While sea floor CH4 source levels might be higher in saturation, this water column reading is well above what one finds in atmospheric concentrations. To convert from ppm to ppb, which is the regular atomspheric measure, add three more zeros and assume that the comma is the US decimal. The reading is 3,188 ppb.